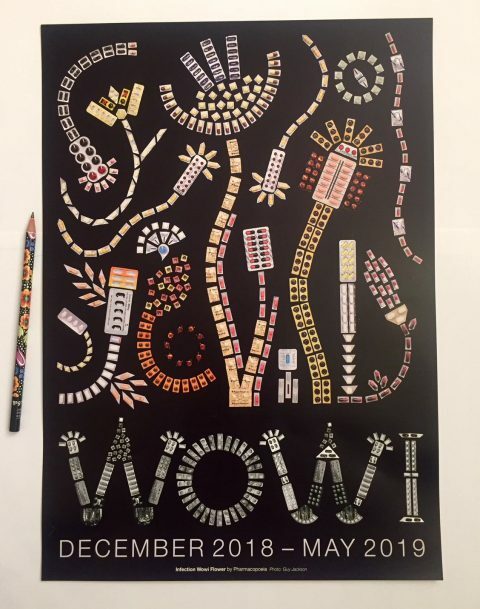 WOWI is an acronym for What Once Was Imagined, a reference to William Blake’s proverb ‘What is now proved was once only imagined’, and the title of a beautiful exhibition at the Royal College of General Practitioners. There are 28 exhibits and it opened on the 28th of November, William Blake’s birthday, but I don’t think that was part of the plan, just a happy and auspicious coincidence. It was only at the opening of the exhibition that I realised Susie and Liz have been friends since they were at school together years ago in Lewes, East Sussex. They then each went their separate ways until many years later in 1998 when they began working together under the name Pharmacopoeia. 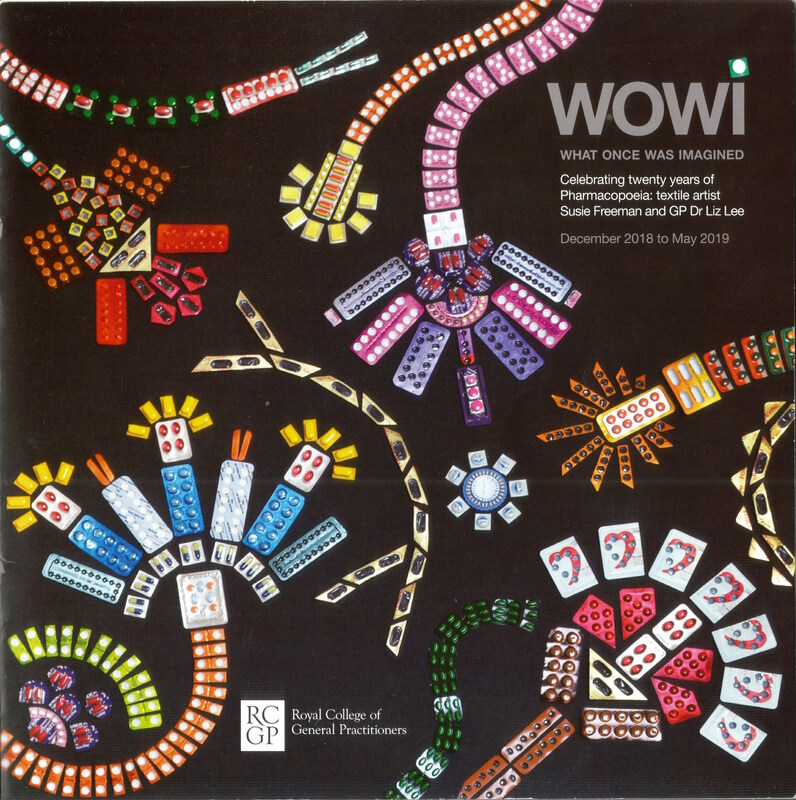 Susie established herself as a textile artist of great originality early in her career. 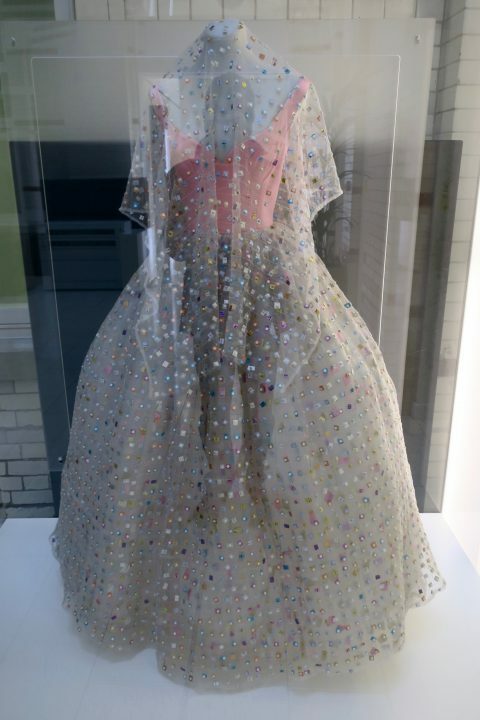 As a student at the Royal College of Art she invented a knitted network of pockets using a monofilament thread: into each small transparent pocket she dropped a tiny object before safely sealing them with a further row of knitting, and repeating this to construct the cloth. 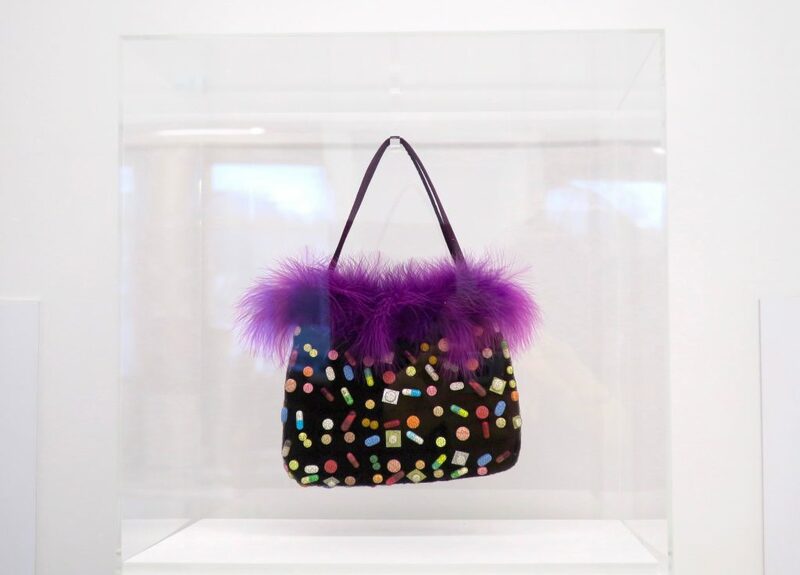 The trapped artefacts started as scraps of brightly coloured fabric and ribbon but Susie soon moved on to treasured shells, buttons, sequins and other precious finds as well as discarded pistachio shells, spices and dried herbs. 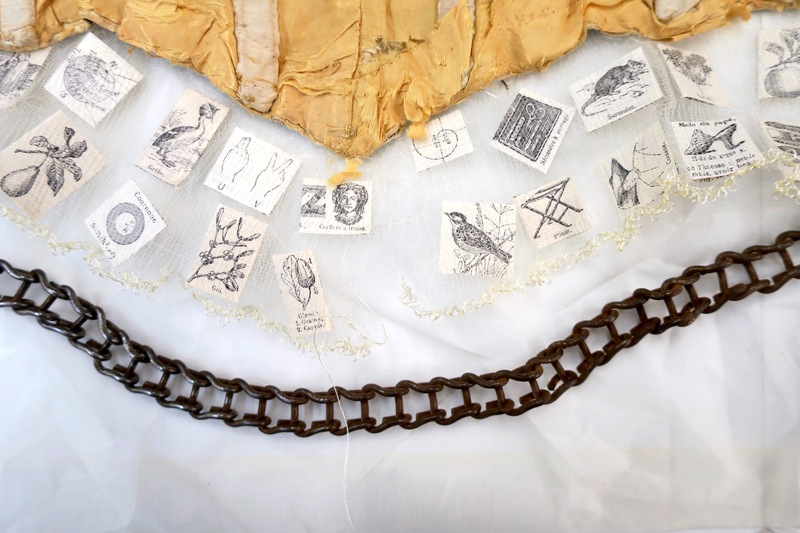 At the same time she explored different ways of using and showing these works by fashioning cowls, scarves and jackets. 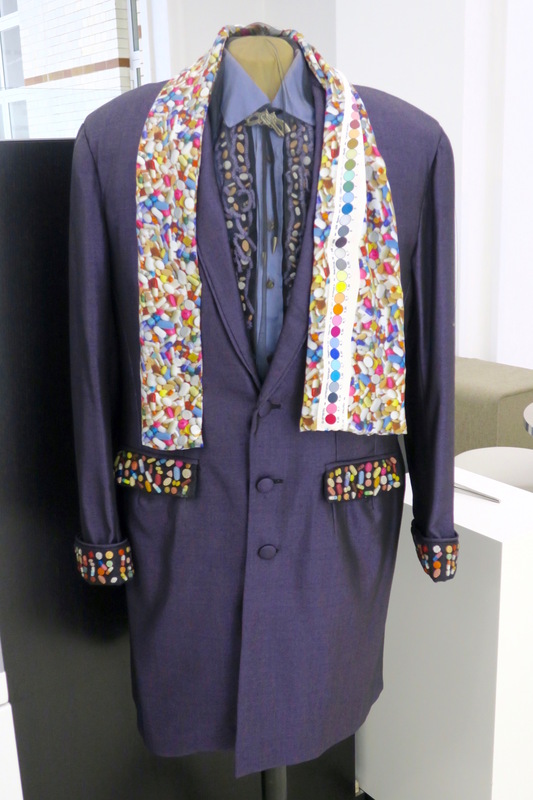 These wearable garments were very distinctive, selling at Chelsea Craft Fair and in galleries – and attracting an admiring, loyal following. As her children grew up her strong ethical concerns for society found voice through her friendship with Dr Liz Lee. Together they started to question our increasing dependence on medicines and Susie began to imagine how their ideas could be visualised through her work. Taking the name ‘Pharmacopoeia’ their collaboration used innovative artistic imagery to explore social concerns around health. 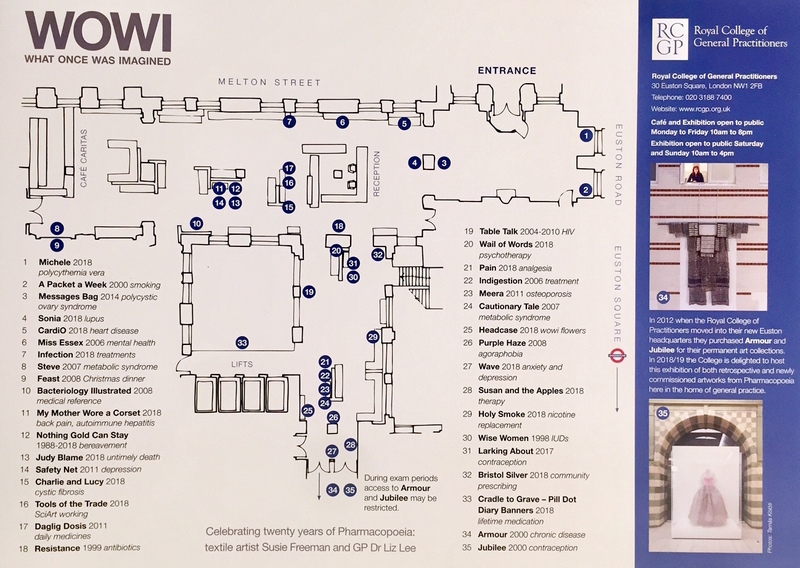 The success of the first Pharmacopoeia touring exhibition and a conversation with Dr Henrietta Lidchi at Chelsea Craft Fair in 2001 led to a commission from The British Museum for a major permanent installation ‘Cradle to Grave‘ which has captured so many people’s interest and imagination. 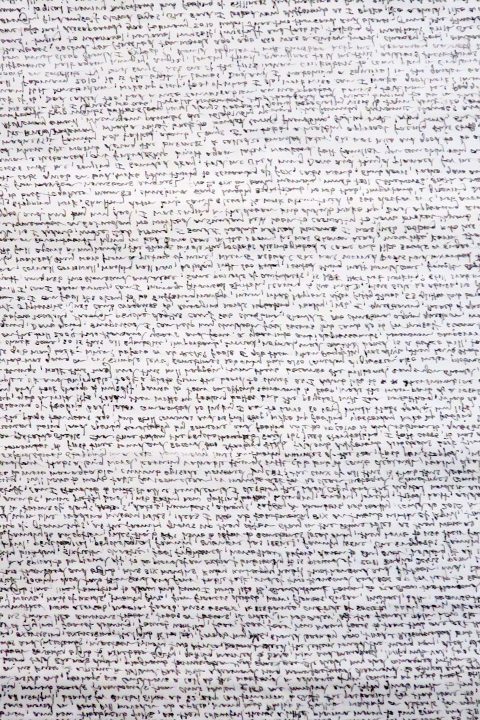 Invitations followed from countries as near as Denmark and as far as Brazil with the scale of the work escaping the confines of the tiny pockets. 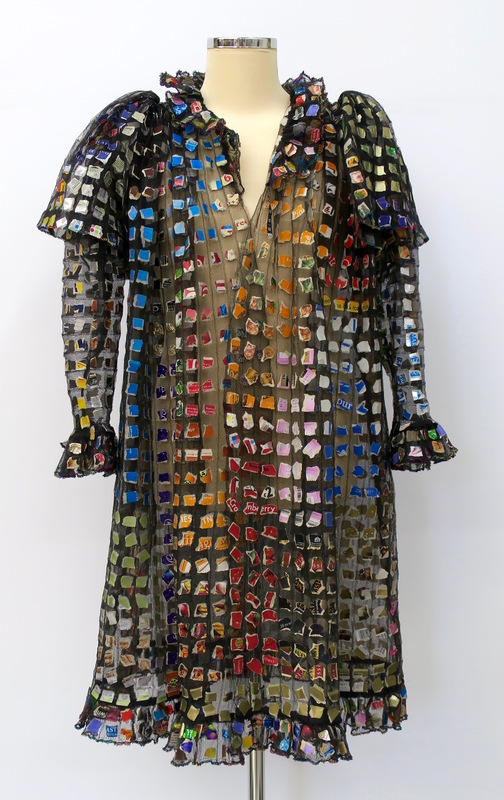 Huge suits of armour and flowing garments, constructed from metallic pill packets, describe the issues that the work addresses; issues which become more vital each day. 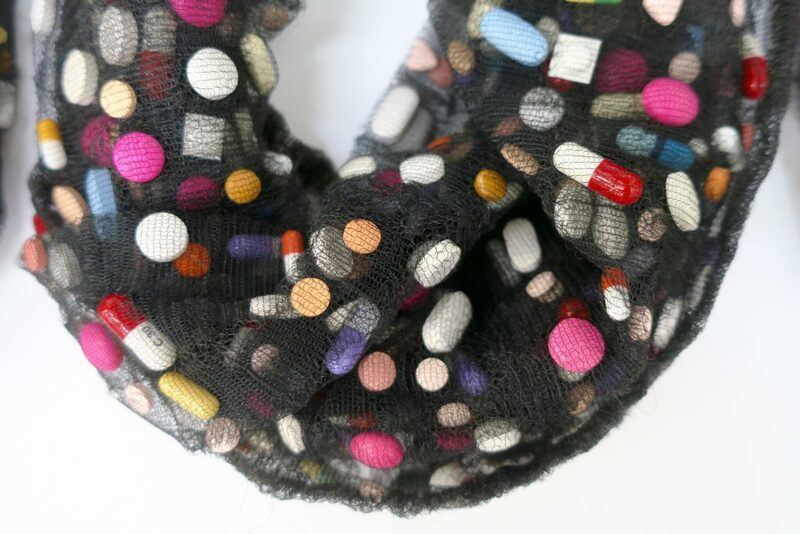 Pharmacopoeia is a medical art collaboration between the textile artist Susie Freeman and myself, Dr Liz Lee. I am a family doctor with a practice in Bristol. 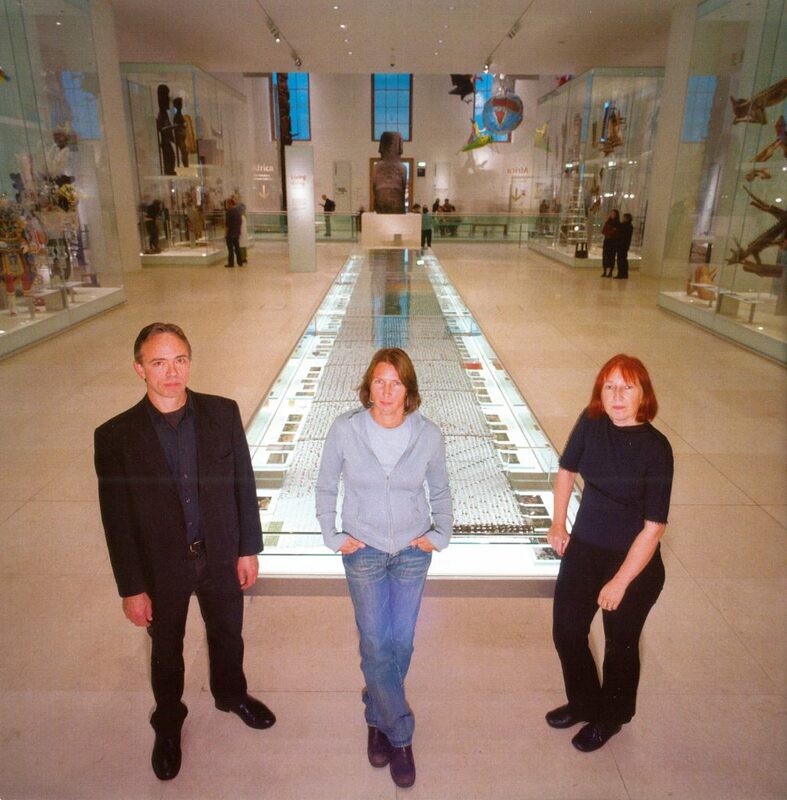 Susie and I have been working together since 1998 and have exhibited widely throughout the world. 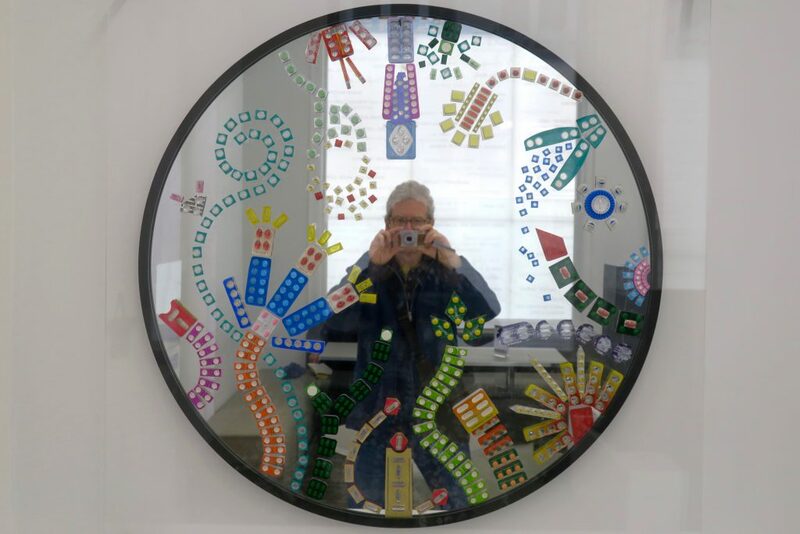 Our agenda is to examine and reflect on a biomedical approach to health and ill health through art. The body of work that we have produced over the past two decades reflects our ideas about the relationship between modern medicine and human experience. There is an emphasis in our collaboration on the pharmaceutical, but from that can emerge an illness narrative that is more widely resonant. When working together we move backwards and forwards between the raw medical data of disease and pill taking and the emerging human story. Together, Susie shapes these into physical artwork. 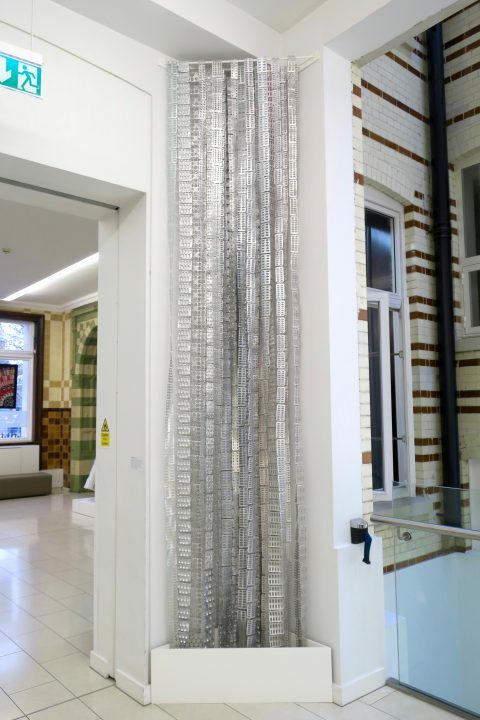 In 1998 we won a Wellcome Trust SciArt award and at that time our work was tightly focused on prescription medication. 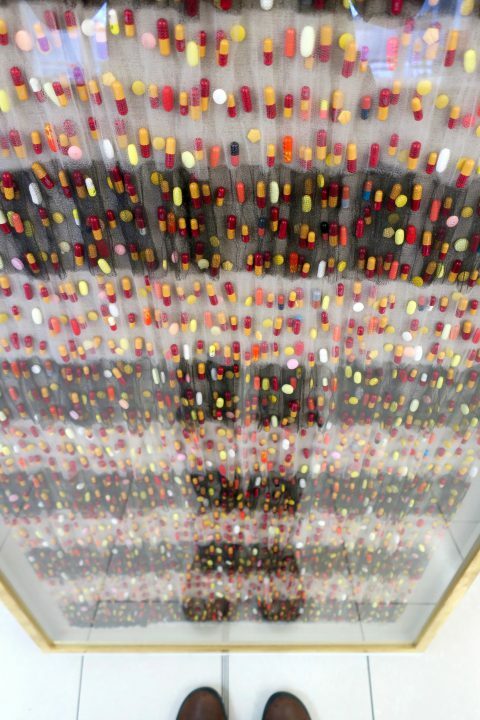 Since then our gaze broadened out, but nevertheless the core of our work is about pills. We are perhaps best known for the installation ‘Cradle to Grave‘ in the British Museum, which was made in 2002 with the artist David Critchley. 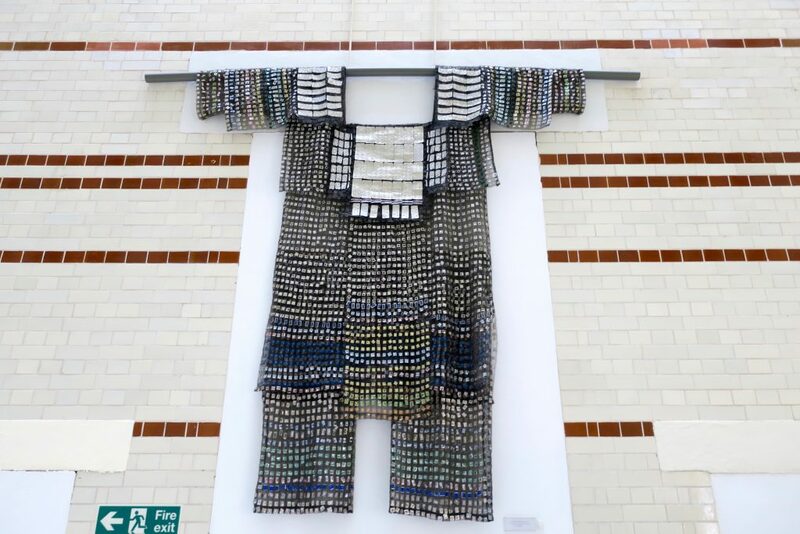 In this piece we calculated, collected and knitted into two long strips of cloth all the prescription pills a woman and a man in the UK would take during their lifetime. 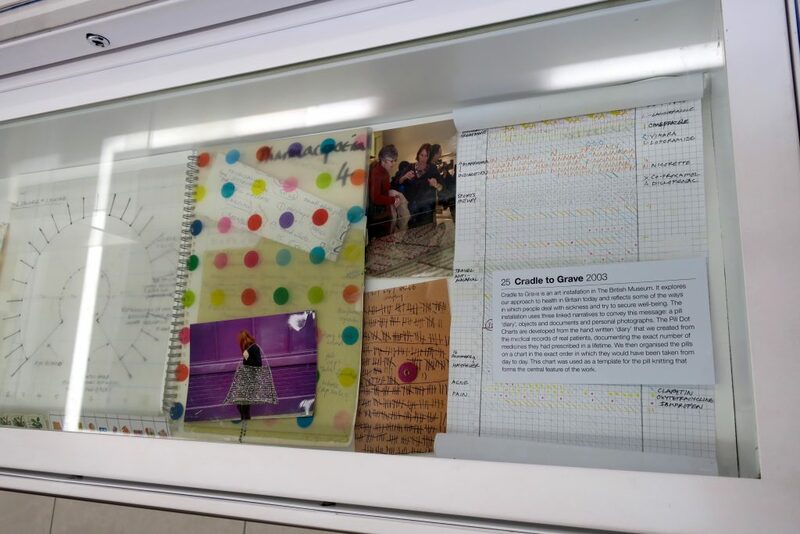 Presented alongside the ‘pill narratives’ in a large glass vitrine runs a series of personal objects and a timeline of photographs from family albums that illustrate times of health and ill health in everyday life. Extremely popular with a broad audience, ‘Cradle to Grave’ is celebrated internationally because of the way that it reflects the lived experience of the audience. As a doctor I believe that compassion in medicine is best experienced in relation to the individual patient and from the outset this view has informed the way that Susie and I work together. Our working methodology involves us choosing a medical condition that we want to make work about and then identifying a suitable patient who has a full prescribing record available. Susie then uses this to consider the form that the final work might take and which knitting and construction options she might use whilst I talk to the patient about their medical story, how it has affected their life and their feelings about their medication. Once consent has been obtained, I use their real GP prescribing record, which is precise and often extensive going back for many years, to identify exactly what medication they have taken. 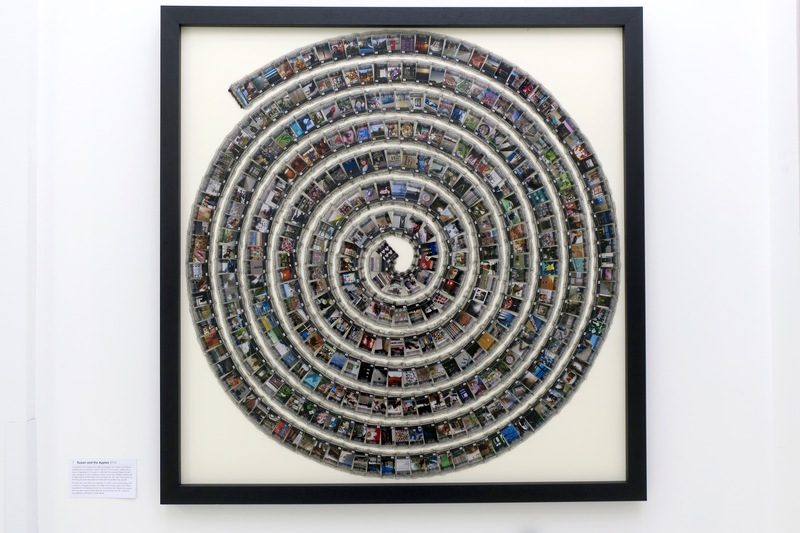 We use this information to inform the work in a number of different ways but always with a view that the final artwork, whilst containing factual data, transforms it into a revelatory form. 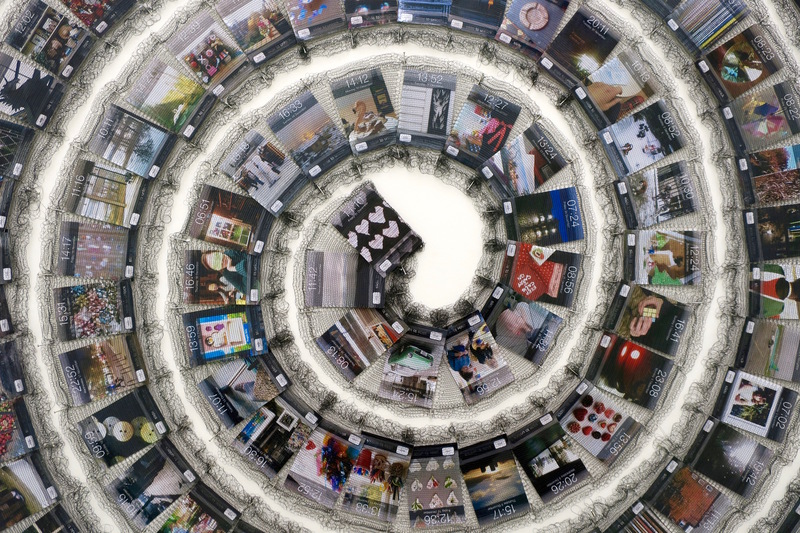 We look to find new ways of viewing the everyday. Packaging for treatment of head and neck illness, from headache to thyroid disease and everything in between. Take your selfie here! Pharmacopoeia have created a coat for Sonia with a selection of the empty packets from the prescribed pills she took between July 2010 and December 2013. They include hydroxychloroquine, mycophenolate, prednisolone, nifedipine, diltaizem, aspirin, risedronate, calcium carbonate and paracetamol. Sonia has had Lupus for 30 years. She first developed symptoms at the age of 31 but they settled when she became pregnant only to recur again after her daughter was born. She had vasculitis of the fingers, aching joints and lethargy and was formally diagnosed aged 35 years. Since then she has been on a number of different treatments including Disease Modifying Anti Rheumatic Drugs (DMARDs), steroids, anti-hypertensives and some analgesics. The side effects of the drugs have meant she also takes bone protection and Proton Pump Inhibitors (PPI) as stomach protection. Sonia reports that she is currently in very good health and that she takes her medication exactly as prescribed. This WOWI Flower is made from the packaging of medication used in the treatment of bacterial, viral, yeast and parasitic infections. Cellulitis is represented by a stem of flucloxacillin with clarithromycin tracking up the centre of the picture to a triple therapy bloom for indigestion. Two spikes of amoxycillin and prednisolone treat chest infections in a patient with Chronic Obstructive Pulmonary Disease (COPD) and there is a small cluster of penicillin for tonsillitis. There are stems of antiviral treatments for shingles and herpes, the antibiotic azithromycin for sexually transmitted diseases and diflucan for thrush and athlete’s foot. Yellow nitrofurantoin capsules tops, packs of ciprofloxacin and norfloxacin used to treat urinary tract infections. An exotic malaria shot features as GPs prescribe prophylaxis to protect travellers from malaria parasites while TB tablets are surrounded by over-the-counter remedies for viral coughs and colds. 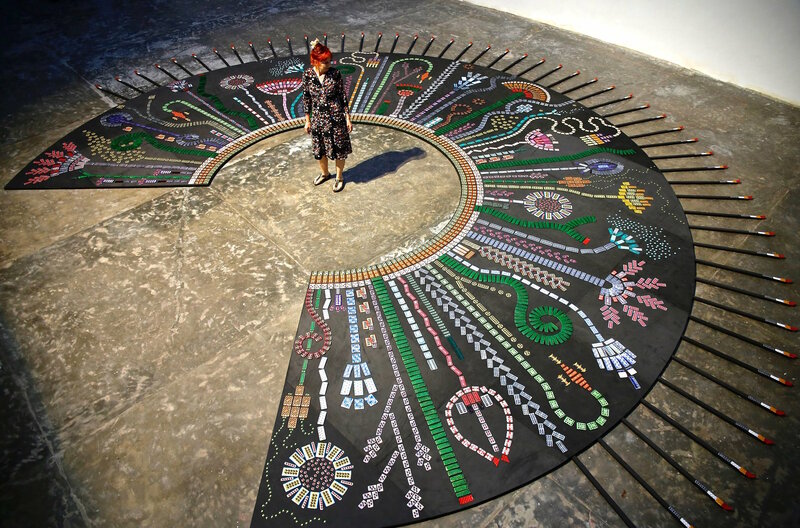 This picture is made from medicines currently used to treat diseases of the heart. Considerable crossover exists between treatments and so we have displayed them as interlocking petals of one exotic flower. Coronary Heart Disease: ACE inhibitors, calcium channel blockers and B Blockers, statins, aspirin and clopidogrel are all regularly prescribed. Arrythmias: Atrial fibrillation is the commonest disturbance of the heart rhythm and is treated with blood thinning medications including warfarin and Direct-Acting Oral Anticoagulants (DOACs). Heart failure: Diuretics are added to many of the above treatments for heart failure. 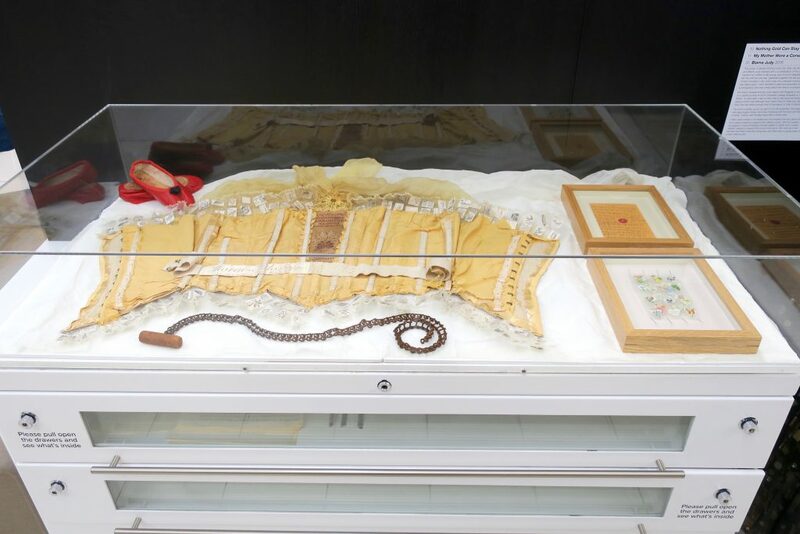 The two flower pictures above, Infection and Cardi-O, recall an earlier flower piece, What Once Was Imagined, a site specific floor piece in the shape of a giant mantilla. Packets of pills were used to draw floral shapes in reference to plants as the origin of many of our present day medications. It was exhibited at the Oscar Niemeyer Pavilion in São Paulo, Brazil in 2015 as part of INVENTO – The Revolutions That Invented Us. But it was later lost, reportedly thrown away by the cleaners! Michele was diagnosed with Polycythaemia Vera when she was 47. For some time she had been feeling excessively tired and unusually breathless. Her GP took a blood test which showed that she had five times as many red blood cells as she should have. She had Polycythaemia Vera, one of a group of blood cancers known as the Myeloproliferative Neoplasms. Initial treatment was to take a pint of blood from her (venesection) and this was repeated every month for two years. She then started chemotherapy with the tablet Hydroxycarbamide and so far has not needed further venesection. Sadly her fatigue persists and she is vulnerable to infections which significantly reduces the quality of her life. Life expectancy for PV continues to improve as treatments are developed and the genetics associated with the condition are better understood. 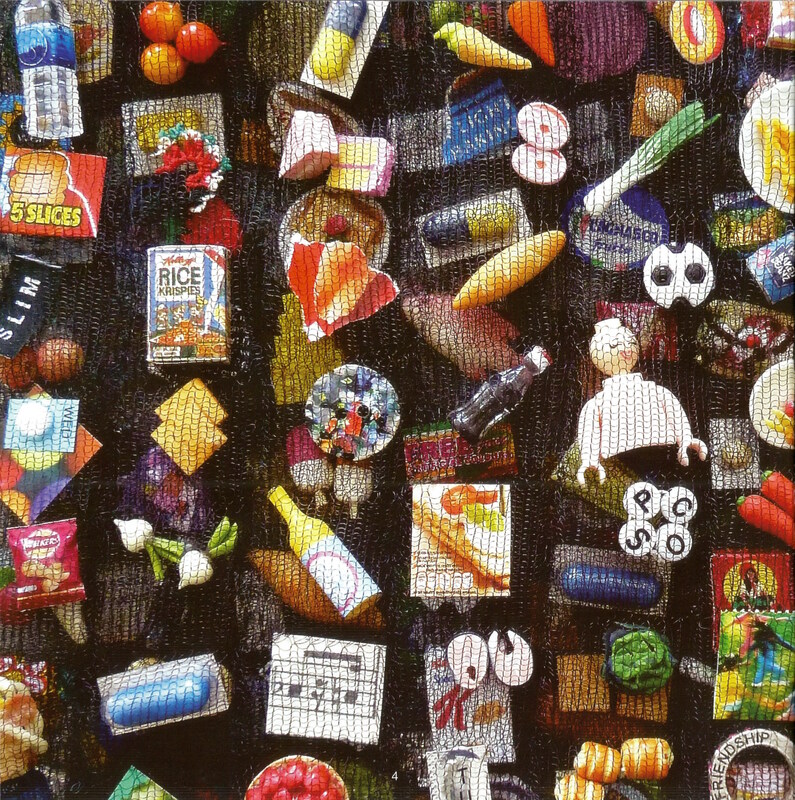 Miniatures trapped in tiny knitted pockets reflect the abundance of food we all navigate daily. 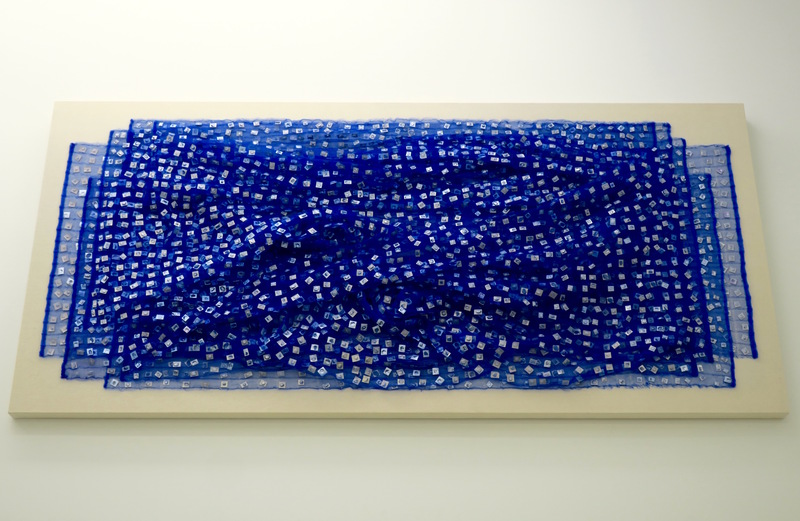 Pharmacopoeia’s particular focus in this artwork is the treatment of Polycystic Ovary Syndrome. PCOS is a cluster of frequently occurring symptoms including acne, irregular or infrequent periods, unwanted hair growth and obesity. Currently over one in ten women has the syndrome which in mild cases is often undiagnosed but when severe it can be devastating. The underlying cause of PCOS is genetic. Women with the syndrome have what have been described as ‘thrifty genes’. PCOS is common because having thrifty genes confers a survival advantage in times of famine. But we live in a time of plenty and therein lies the problem. There are a number of treatments but most effective of all is to diagnose young women early, educate them about the need to avoid creeping weight gain and then offer support to help them with this difficult task. 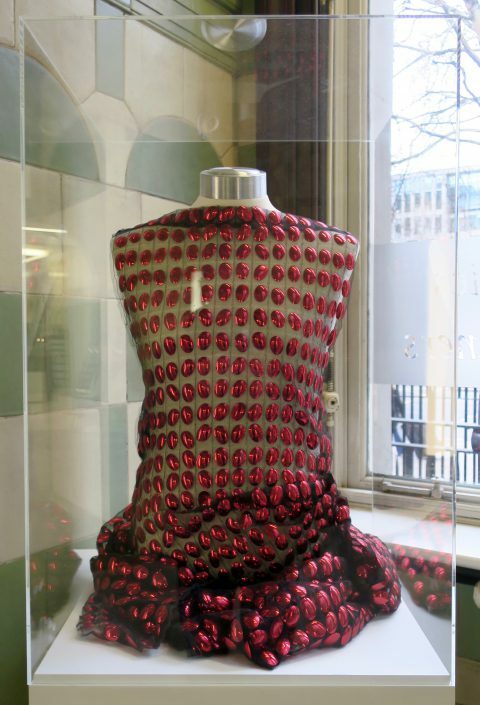 The dress is formed from every page of Liz Lee’s 1976 textbook ‘Bacteriology Illustrated’. 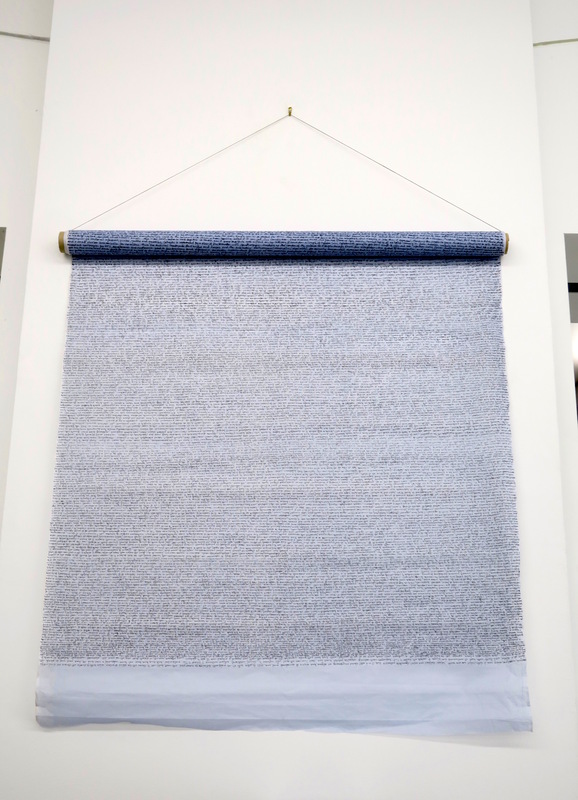 The process was painstaking and precise, each page torn into 130 pieces and placed in the correct sequence to form reconstructed pages paired across the weft. Running along the warp two by two for 610 rows, there are 15,860 pockets in total. 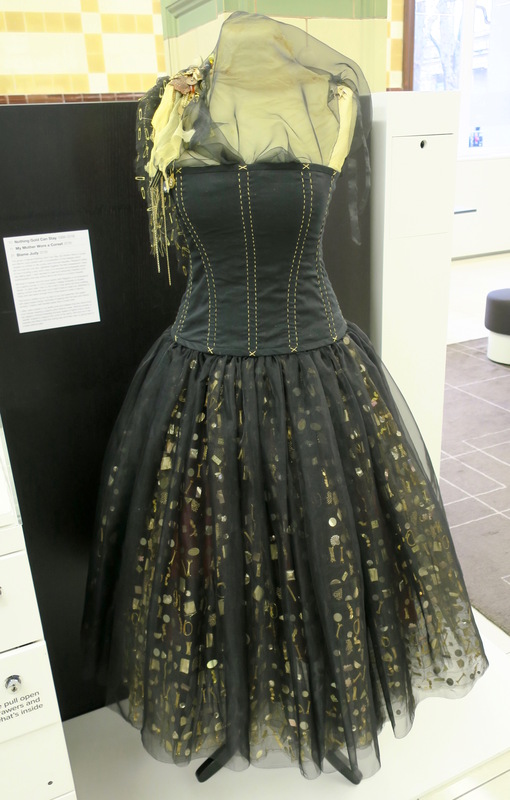 The language of dressmaking and tailoring becomes layered with a different set of meanings when applied to ideas concerning infectious disease. The boned corset contains the body, the boned book cover both holds the information within and tries to control the billowing spreading fabric. Throughout 2010 Susie shot a daily photograph and made it her iPhone screensaver and clicked to save it with the 24 hour clock. Coping with a wave of depression in the year my dad died the process helped me feel I was managing to work creatively at least once a day. Similarly knitting with a single strand all 364 frozen time moments into one ‘year’ has helped me live through recent life events and deal with the anxiety they caused. The title has more than one meaning. It is both a nod to technology and a memory of apples stored in the cellar of the house I grew up in. More importantly it will always remind me of someone who helped me unravel the long gone past to heal a little girl and reconcile worries, confusion and sadness sufficiently to heal herself. Charlie and Lucy both have Cystic Fibrosis. 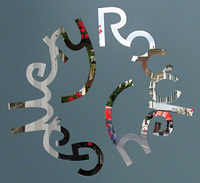 We have been following their progress for over twenty years and have made a number of artworks about them. Cystic Fibrosis is a condition that is inherited via autosomal recessive genes. These genes cause a disturbance in the way sodium chloride is transported at a cellular level. This causes fluids in the body to be more viscous than normal and these clog up various organs including the lungs. Daily treatment is directed at keeping the lungs as clear as possible by a combination of physiotherapy, inhalations and antibiotics. Both Charlie and Lucy take capsules of enzymes with every meal to help replace the digestive enzymes that they cannot produce naturally. Lucy has developed diabetes, Charlie has not. There are over 2,000 specific mutations of the CF gene. Lucy has the G551D mutation in the cystic fibrosis transmembrane conductance regulator (CFTR) gene. For two years she has been taking the drug Ivacaftor. In people with the G551D mutation Ivacaftor acts as a CFTR potentiator and improves the transport of chloride through ion channels. This is the first drug that treats the underlying cause rather than the symptoms of the disease. It costs thousands of pounds a month. At present no gene therapy is being developed for the mutation that Charlie has. This group of pieces (‘Nothing Gold Can Stay’, ‘My Mother Wore a Corset’ and ‘Blame Judy’) started with a consideration of the disease which caused my mother to die young, auto immune hepatitis. Research online left me cold but one day I gathered together the few possessions I have of hers including a very worn copy of a Larousse encyclopaedia which was falling apart. 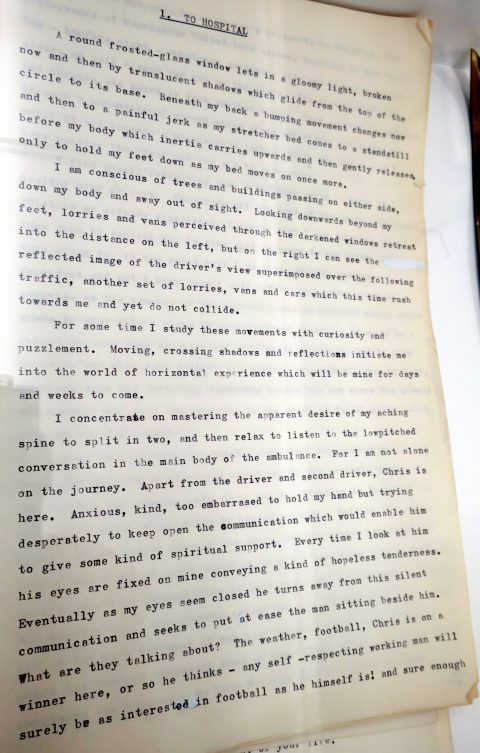 I then decided to read and transcribe chapters of an autobiography she was writing about her time in a London hospital. We lived in Sussex and the book opens with Pegotty in an ambulance on a painful journey to UCH (University College Hospital) on Gower Street. 10 years later I had my first child in that same red brick building, taking comfort that although mum hadn’t lived to meet Leo, Matthew or Ruby she had spent enough time in that space to write a memoir. The book is written up by my dad on our old typewriter, thin paper with aged edges brings memories of playing with the keys and ribbon winding. Creamy well handled paper like corset cloth. I often used corsets in my textile work and realised that this stems from mum always wearing a peachy pink medical corset. Stitched panels, a zig zaggery of lacing threading through eyelets to tightly hold a velvet ‘saddle’ shaped to support the curve of her spine. She told me in her twenties she lifted a bed the wrong way and there was no going back to a back without pain. This coat is made out of all the packaging from the food Susie’s family ate on Christmas day. The ghost of the family feast trapped in the pockets of the coat contains echoes of many other celebrations and days of excess. We reflect that many of us now dine like Roman Emperors every day of the week, every day is a feast day. These are pills that have been prescribed to a patient with complex mental health problems. In spite of repeatedly requesting medication on prescription she often hoards her tablets rather than taking them. From time-to-time her support worker clears out her cache of pills and returns them to the surgery. 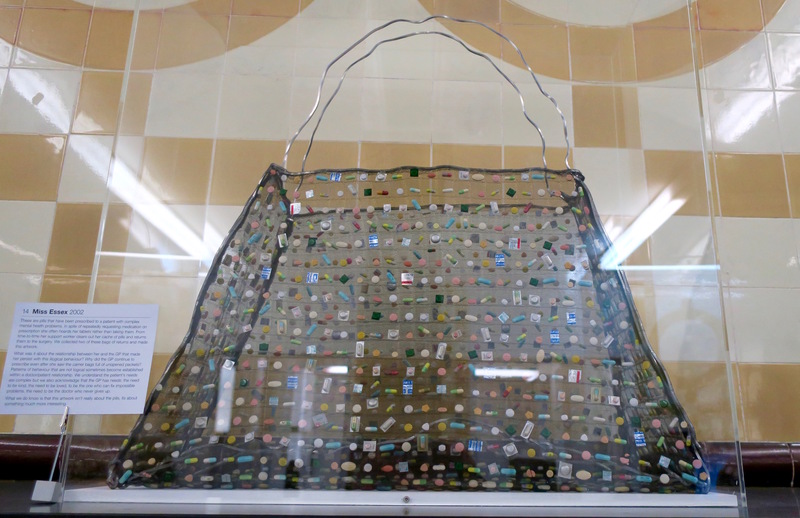 We collected two of these bags of returns and made this artwork. What was it about the relationship between her and the GP that made her persist in this illogical behaviour? Why did the GP continue to prescribe even after she saw the carrier bags full of unopened packets? Patterns of behaviour that are not logical sometimes become established within a doctor/patient relationship. We understand the patient’s needs are complex but we also acknowledge that the GP has needs: the need to be kind, the need to be loved, to be the one who can fix impossible problems, the need to be the doctor who never gives up. What we do know is that this artwork isn’t really about pills, it’s about something much more interesting. 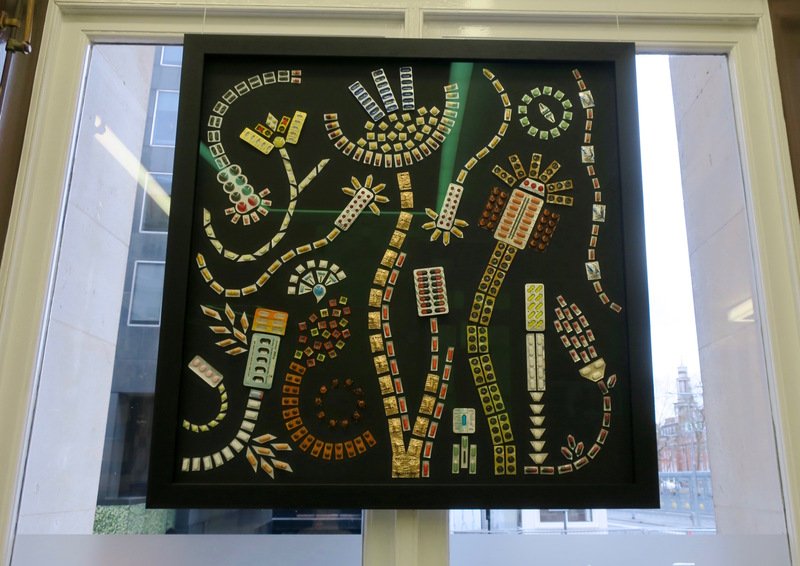 The pills in this framed piece were collected in 1999 and first shown alongside a urine test result showing infection with a multiply resistant bacteria. 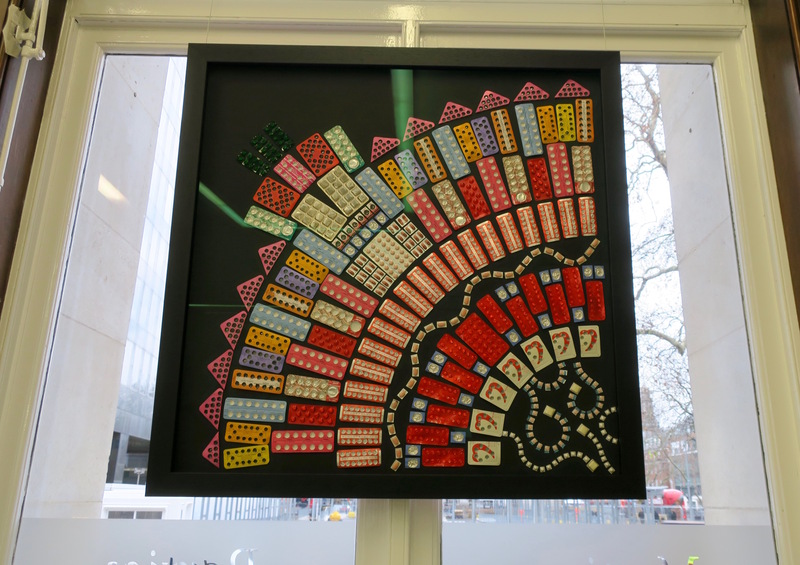 As part of the campaign to raise awareness of the dangers of bacterial resistance in 2012 we reframed it in red and gold to emphasise the jewel-like quality of the antibiotics. They are actually more precious than jewels and GPs continue to overprescribe more than any other group of doctors or vets. 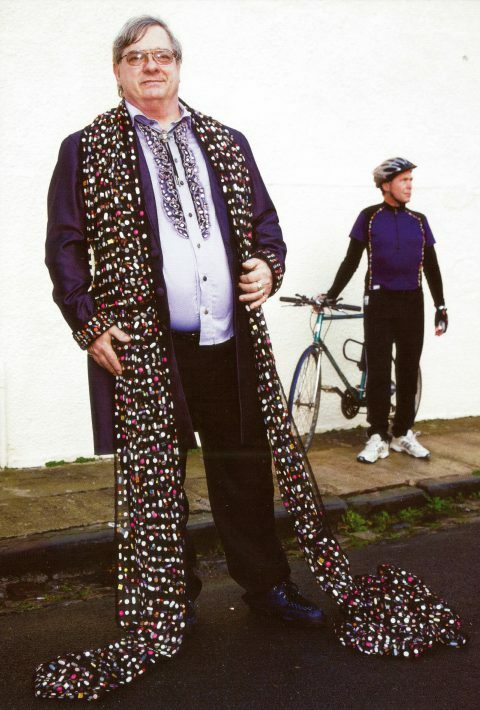 Steve has metabolic syndrome; the triad of high blood pressure, diabetes and obesity. In 2004 he had a heart attack and also suffers from arthritic knees. He has been Liz’s patient for over 20 years and with his permission we documented all the medication prescribed to him in 2006. Susie pocket knitted them into this scarf and with costume maker Jenny Graham tailored a teddy boy drape jacket and shirt with a pill fabric lining. Made especially for Steve, he has posed for pictures for us a number of times. There is one up in the surgery and Steve has a framed print of himself in coat and scarf at the top of his stairs. hypertension, coronary heart disease and arthritis. Photo: Martin Parr. The range of pills that may be taken by an agoraphobic to enable them to go out including antidepressants, diazepam and beta blockers taken to steady their pounding heart. 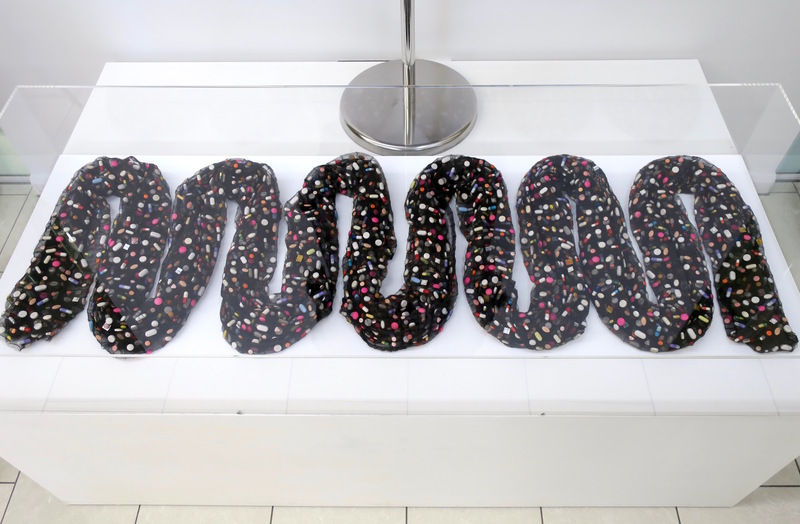 This piece was made long before psychological therapies were widely available on the NHS. Agoraphobics are still a poorly served group caught in the double bind of having to leave their house in order to access therapy. Every GP knows of ‘hidden’ patients who never step foot outside their door. Well Pharmacy in Bristol serves Horfield Health Centre and its 16,000 patients. At our request they collected all the empty packaging from the thousands of dosett boxes they produce in one month. Dosett boxes are pill organisers mainly used by the elderly. They have separate compartments for days of the week and/or times of day such as morning, afternoon and evening. Pharmacy assistants spend hours removing pills from their original packaging and filling these dosetts. 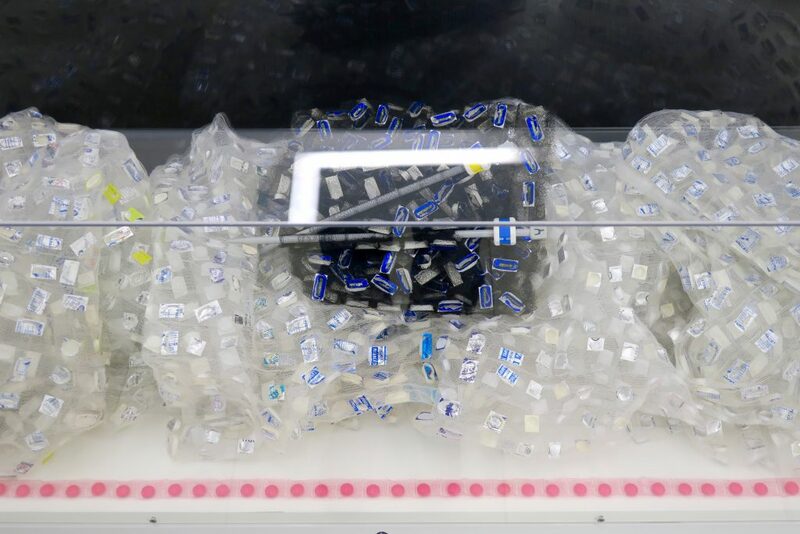 The Waterfall of packaging that we have made from their collection reflect our feeling that we are drowning in medication. One year’s supply of Lansoprazol. In the UK we spend more money treating indigestion than we do treating cancer. A year’s worth of empty packets Holly saved us from all the lozenges she sucked to resist smoking. 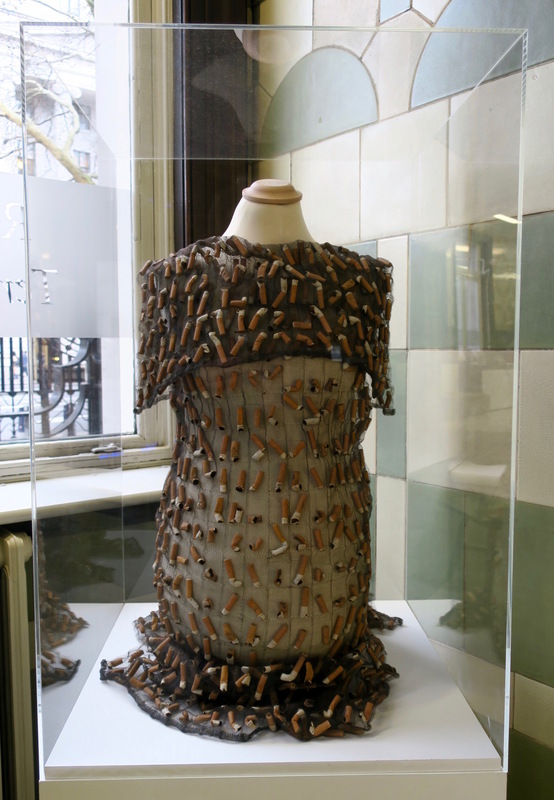 Pocket knitted dress containing 840 smoked cigarette ends. 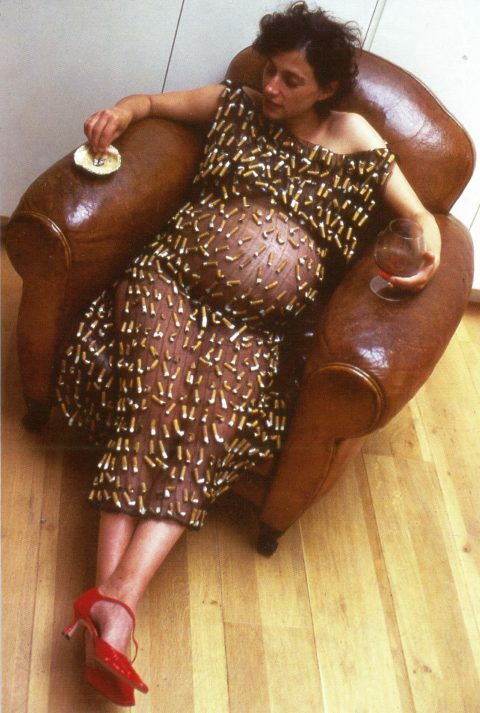 This equates to smoking a packet a week throughout a pregnancy. Some smokers feel that two or three cigarettes a day is hardly even smoking. Seeing the total all together makes this argument hard to sustain. This is where Pharmacopoeia started. In 1998 we were interested in contraception. The Wise Women are IUDs that were removed from patients having provided contraception for between six and fifteen years. 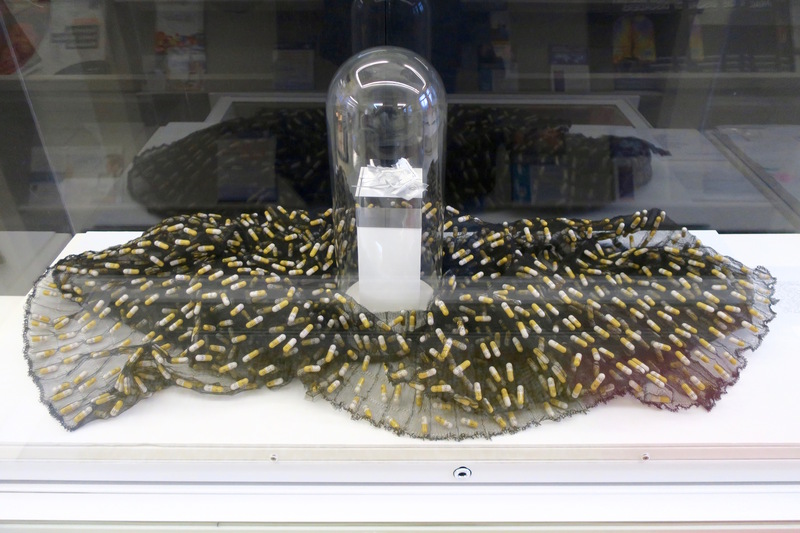 We calculated how many contraceptive pills would have provided equivalent protection and knitted them into a series of dresses. ‘Jubilee’ which is in the permanent collection of the RCGP is made from the number of contraceptive pills needed to get a woman from her honeymoon through to her Silver Jubilee 25 years later. By the time we reached the 2010s thinking had changed. Long Acting Reversible Contraceptives (LARCs) were in fashion especially for young women. These LARCs have a much lower failure rate than the pills and we have been encouraging their use ever since. Here we show example of LARCs – an IUD and two bars of Nexplanon, the hormone delivery system inserted just under the skin of the upper arm. 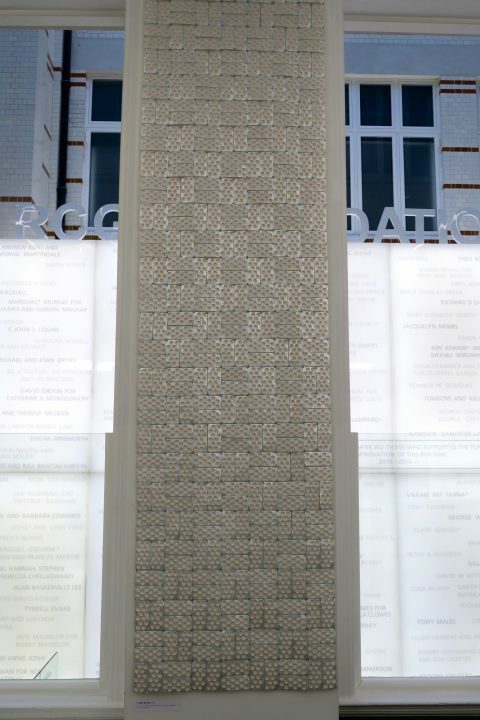 Cradle to Grave is an art installation in The British Museum. It explores our approach to health in Britain today and reflects some of the ways in which people deal with sickness and try to secure well-being. 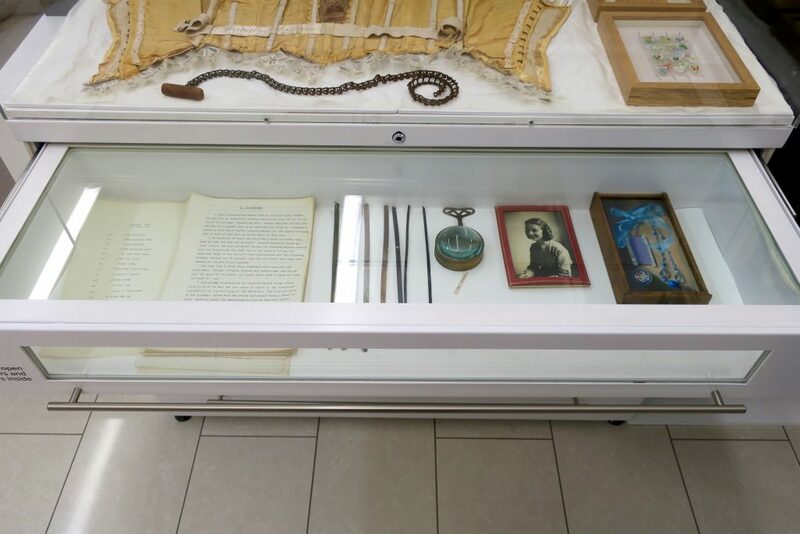 The installation uses three linked narratives to convey this message: a pill ‘diary’, objects and documents and personal photographs. The Pill Dot Charts are developed from the hand written ‘diary’ that we created from the medical records of real patients, documenting the exact number of medicines they had prescribed in a lifetime. We then organised the pills on a chart in the exact order in which they would have been taken from day to day. 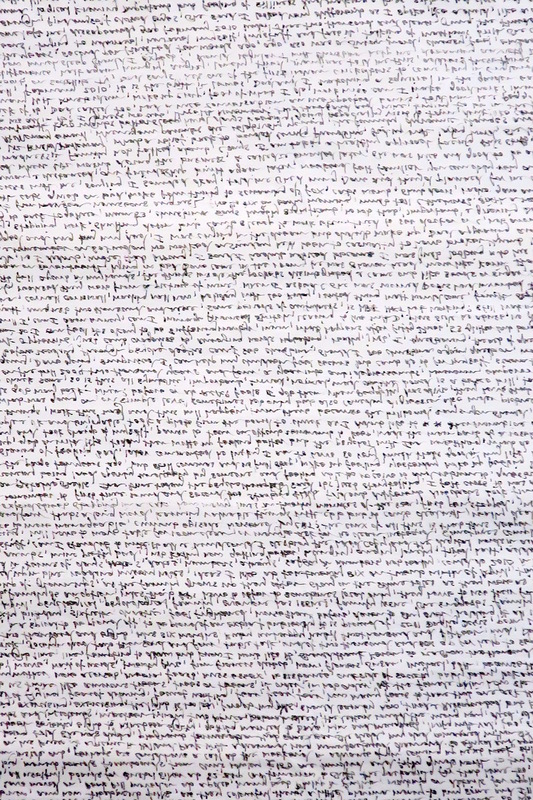 This chart was used as a template for the Pill Knitting that forms the central feature of the work. A dozen years of empty pill packaging. People say depression is the black dog but my feelings were bluer. 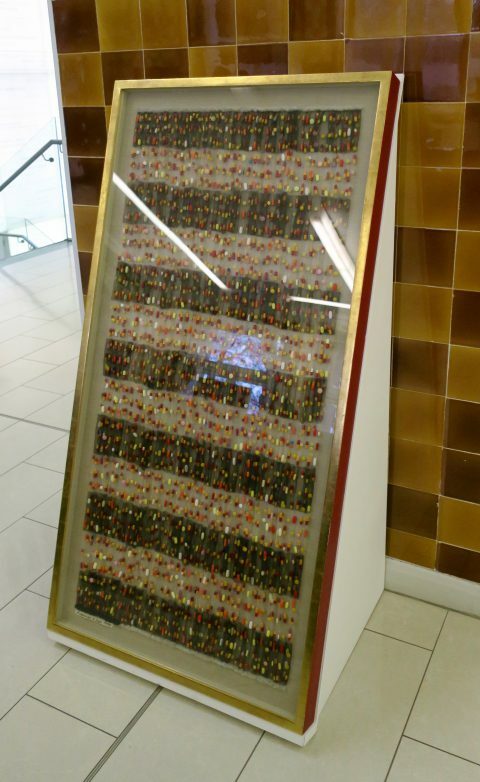 RCGP member Dr Liz Lee and artist Susie Freeman made ‘Jubilee’ in 1999 for the Pharmacopoeia exhibition ‘Sexwise’ and it was bought by College in 2010. The wedding dress is made of 80 denier nylon monofilament, similar to fishing line, hand knitted on a Dubied industrial knitting machine. 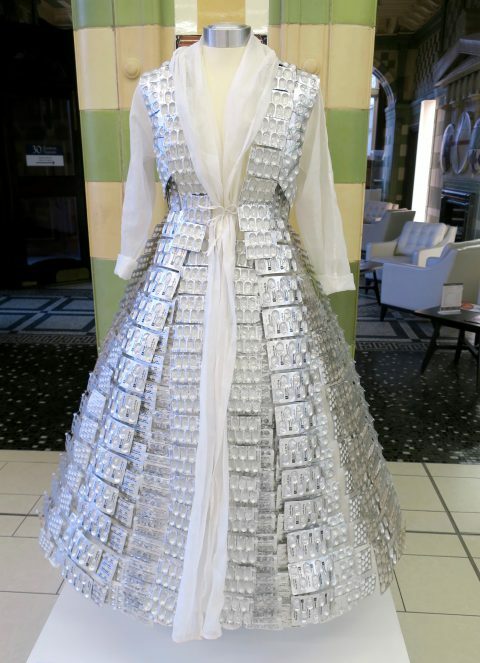 Enclosed in rows of tiny mesh pockets are 6,279 contraceptive pills. Allowing for a couple of breaks to have children this would provide contraception for a woman from the age of 22 to 50 years old and is called Jubilee as a celebration of a woman’s 50th wedding anniversary. RCGP member Dr Liz Lee and artist Susie Freeman made ‘Armour’ in 2000 for their Pharmacopoeia touring exhibition. It was bought by College in 2012. The artwork is made of 80 denier nylon monofilament, similar to fishing line which is knitted on a hand operated industrial knitting machine. 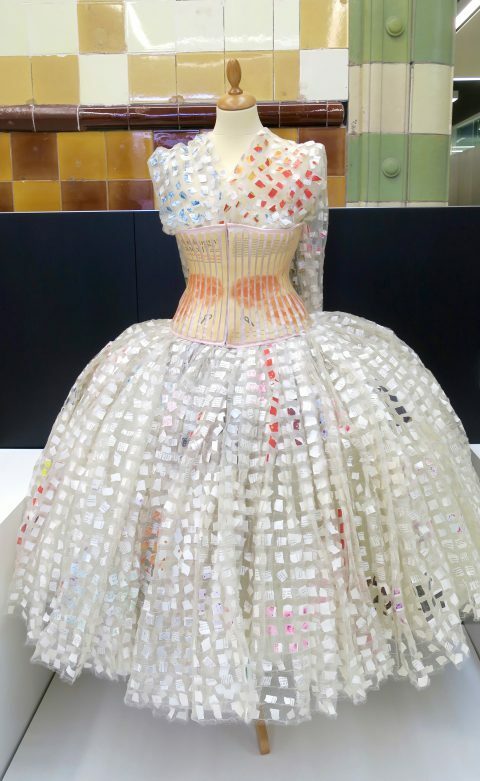 Enclosed in rows of tiny mesh pockets are empty pill packet bubbles. This flexible cloth is formed into a layered T shaped top over wide trousers and an additional breastplate section made of flattened pill packet sheets. There are just over 16,000 individual pill cases. Liz Lee is a GP in Bristol and ‘Armour’ is based on the prescribing record of her patient Mr Brittain. By the age of 77 he had smoked for 50 years, suffered two heart attacks and was being treated for hypertension, cardiac failure, COPD, arthritis, indigestion and insomnia. PS: There’s now a WOWI poster with a handy exhibition guide on the reverse. 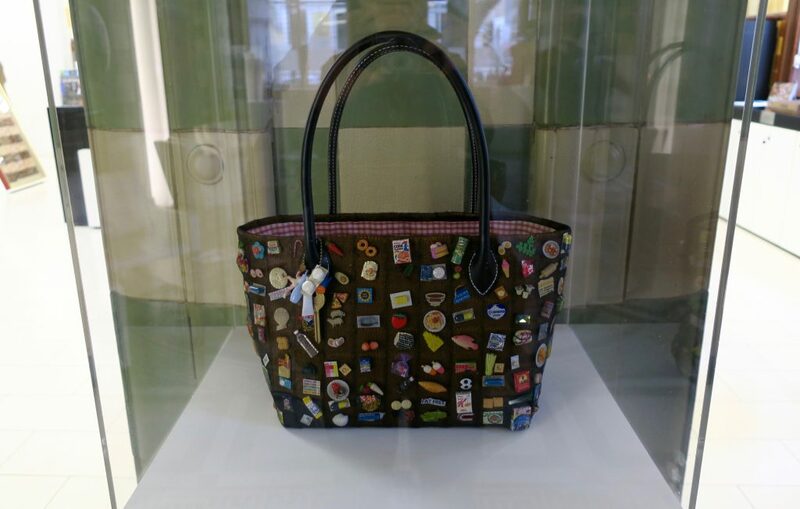 And it turns out there are 33 pieces on display, not 28 like I first thought. 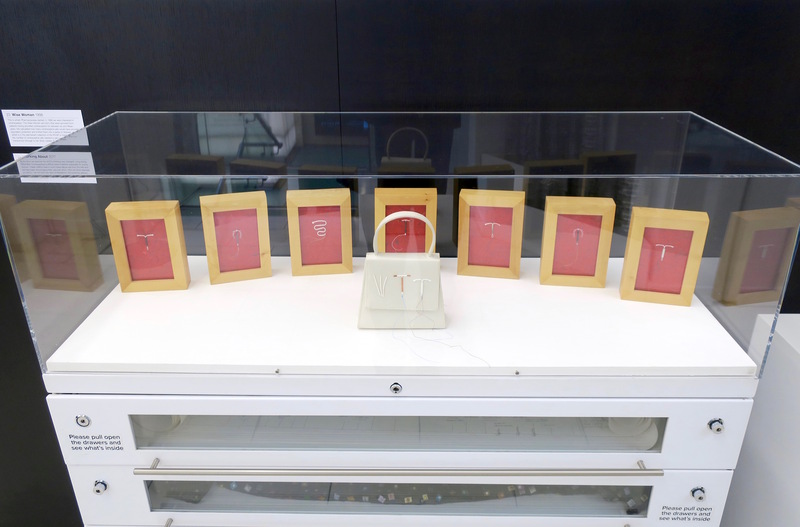 Five more reasons to visit this fantastic show! 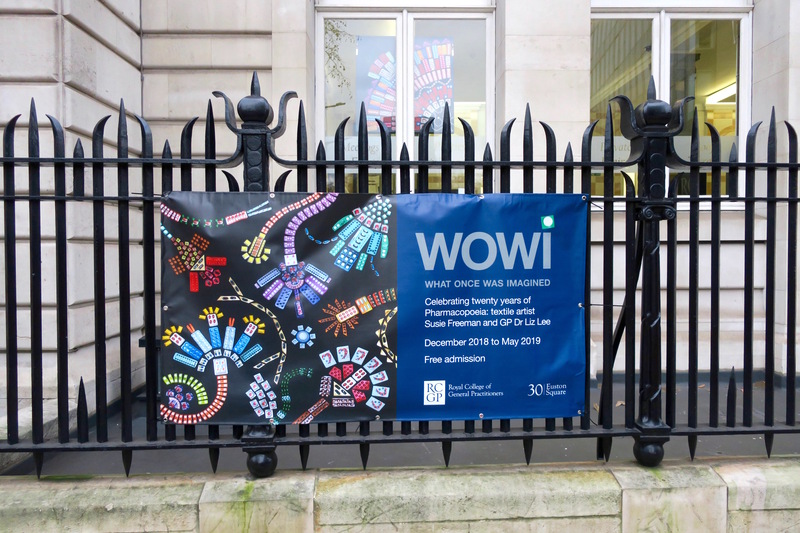 This entry was posted in Art, Textiles and tagged Bristol, British Museum, Cradle to Grave, Liz Lee, London, Mary La Trobe Bateman, Pharmacopoeia, Royal College of General Practitioners, Susie Freeman, What Once Was Imagined, William Blake, WOWI. Bookmark the permalink.